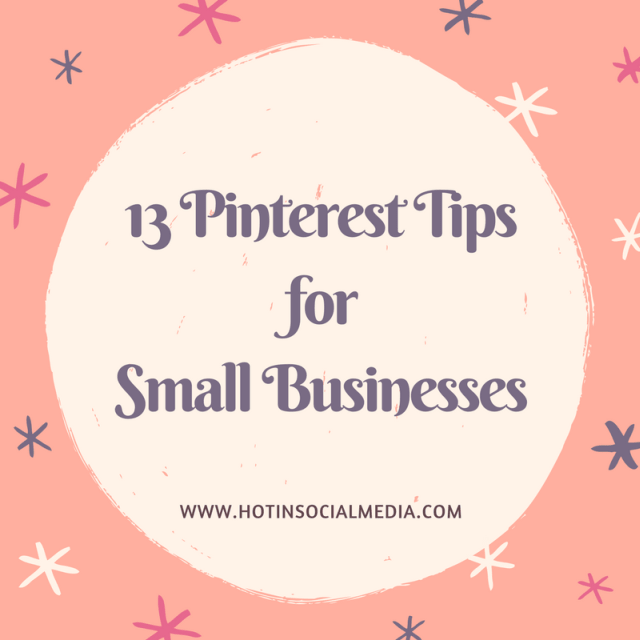 If you’re like most small business owners, Pinterest is incredibly confusing. You know how to use it for personal purposes, but using it for marketing seems impossible. Finally, you have the opportunity to learn how to use Pinterest to your advantage. Follow this simple Pinterest tips for small businesses and you’ll be a pro in no time at all. While some business owners go with a standard Pinterest account, it’s a good idea to open a business account, which includes valuable analytics. You can learn all about your audience so that you’ll know what people respond to and what they ignore. By using that information, you will get more out of your account. Pinterest is a great marketing tool, but it doesn’t have the same reach that you’ll get with Facebook and other social media networks. That is why it is so important to cross-promote your Pins on other sites. Your Pinterest account will end up with more followers, and your Pins will receive more shares. That’s a great way to create some waves. Pinterest lets you include descriptions for each Pin and Board that you post. Include detailed and specific descriptions so that people can find your Pins and Boards easily. In addition, be sure to add all relevant information, such as colors and styles. Then, your Pins and Boards will come up in the site’s search results when people search for your keywords. Just like people like to save money, you like to make money. Bring the two together by pinning coupon codes. Keep in mind that Pins don’t expire on Pinterest, so include coupon codes that don’t have expiration dates. No one wants to see a picture that only features a product. For instance, if you sell printers, do you think people on Pinterest want to see a picture of a printer? Instead, they want to see a picture of a person using the printer. Adding people to your photos makes the pictures more engaging. It also lets people visualize using the products. This simple change will help boost your sales. Social proof makes it much easier to sell products. Provide social proof on Pinterest by adding a board full of testimonials. Put the testimonials in image format and Pin them to the board. That way, when people need to learn more about your products or brand, they can click on the board and get all of the information they want. If people see a product they want to buy on Pinterest, they want to be able to click on the image and go to the product’s page. That means you need to include links with your Pins. Upload your Pin and then edit it to include the link in the Pin’s website box. Your own Pins are great, but you can get even more traction by letting your customers do some pinning. Put a “Pin It” button next to the various products on your site. This will encourage people to Pin your items to their own Pinterest boards. With that, your reach will be expanded a great deal. You won’t just reach your own followers, but your customer’s followers as well. Some small business owners create standard Boards for their products. For instance, they might have a board titled “Printers” and another one titled “Ink.” That’s pretty boring. Instead, get creative by making Boards that people want to see. You can still highlight your products but do so in a creative way. Kate Spade New York provides the perfect example of this. The brand has a board titled “Happiness and Wellness.” It includes Pins related to health and fitness, with each image including a product. There is also a board titled “Family Time”, which has fun pictures that feature family-related products. Your Pinterest account shouldn’t be all about products. You also need to show a personal side. When you humanize your company, people will find it easier to connect with you. That means that you can expect to get more re-pins and make more sales. Behind-the-scenes images are perfect for this. You can show people making your products and working around the office. You can also tell stories with your images, so create an entire series of personal photos. Most people want to know how much something costs before making the effort to visit a website. Be upfront with your visitors by adding prices to your descriptions. Pinterest makes this easy to do. By adding a $, followed by the dollar amount, Pinterest will add a price tag to the Pin. When people re-pin your images, you want their followers to know that the image belongs to you. You can accomplish this by adding a watermark to your images. The watermark can either be your URL or your company’s name. When people see the image, they will associate it with your brand. Many of those people will even visit your Pinterest account or website to learn more. When people re-pin your images, be sure to thank them. In addition, if they comment on your Pins and Boards, comment back. For high levels of engagement that will help your pins grow in popularity, it all starts with you. The more you reach out to people, the more your engagement levels will grow. Pinterest might seem confusing at first, but it is actually relatively simple to master. Follow these tips and you will create an engaging account that will get results. You’ll also have a lot of fun in the process.